Ame, Look at what I wrote. The calls of 1:17 were different, very strong, I heard them from far. 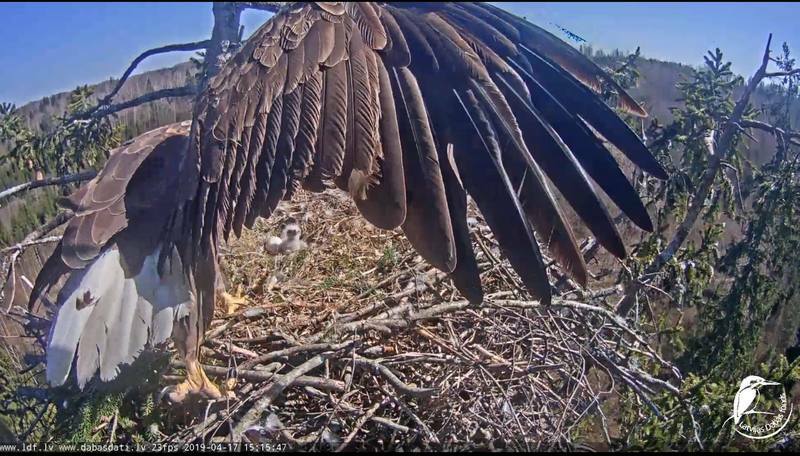 And at the same time, when I got up to the computer, I saw her moving in the nest, between bowl and fish. 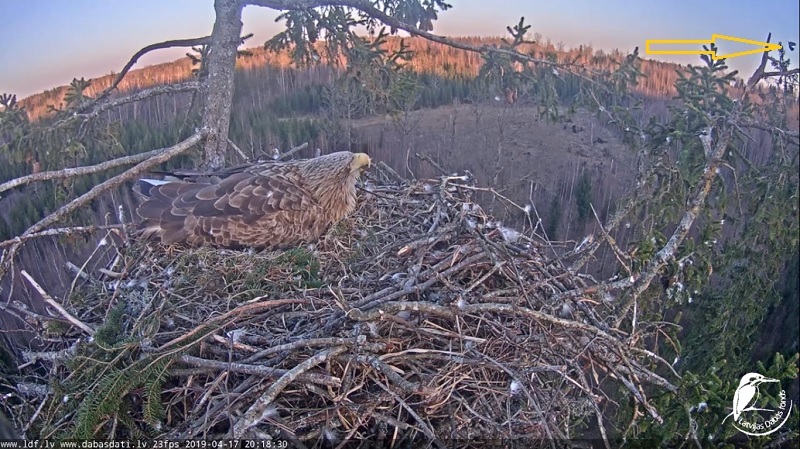 Anyway, she was active there, white parts were moving..
17:33 they looked up, must be a crow etc. yes, Milda had very little rest last night. her head was up and moving most of the time. the little rascal chirped a lot and loud, and i suppose it was also wiggling under mummy's wing most of the night. only after 3 am it was a little more quiet. for a few hours. i think so, too. they are cheeky enough to come this close. ravens stay at a much larger distance. i watched the video in slow motion and i can't see who it was. i also took pictures frame by frame but i can't see anyone there either. Evening conversation with the child. He is starting?? there is no fish for the night?? 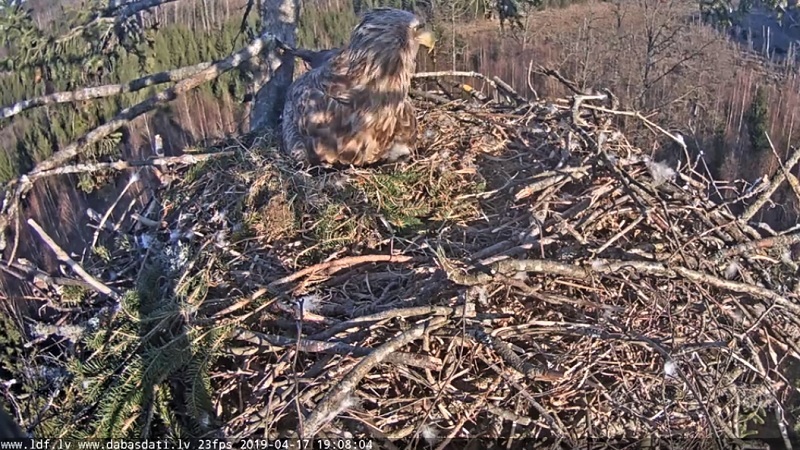 18:00 Milda preened and rolled the eggs. 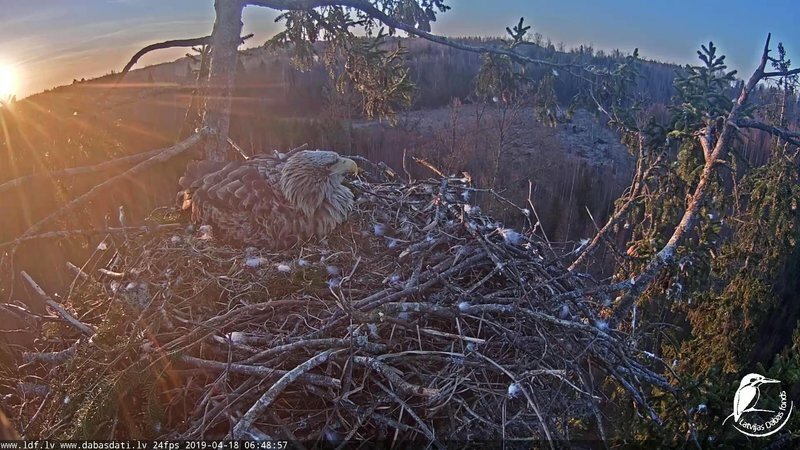 19:00 Milda preened androlled the eggs. this was a bird with long legs and thus a wader. perhaps a green sandpiper (Tringa ochropus)? it made voices which could belong to a green sandpiper. this was a good observation! 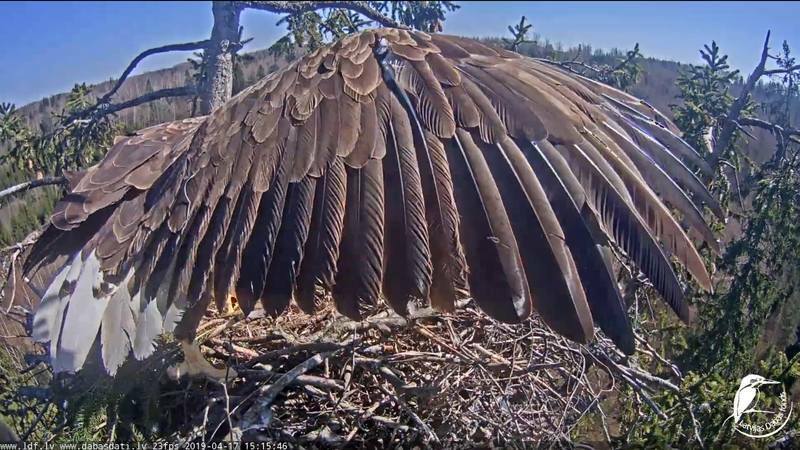 19:11 Milda got up but didn't feed the baby. 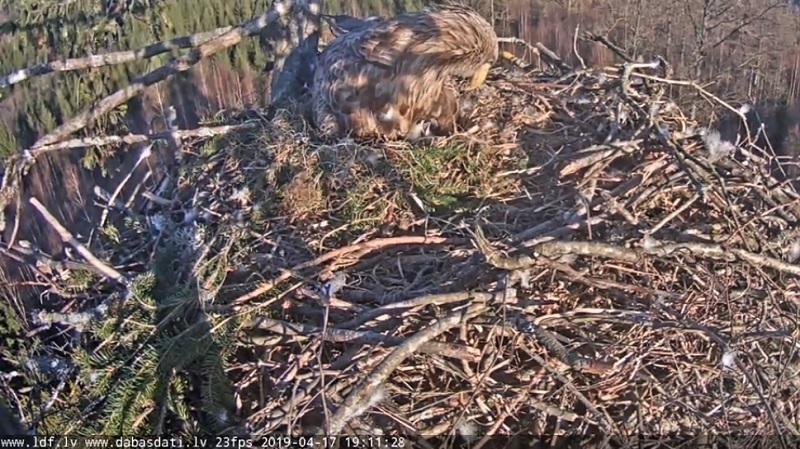 20:03 Milda got up but didn't feed the baby. 20:11 again. is there no food? where is Raimis? i think this was a wood pigeon (Columba palumbus). he began to sing on the top of the spruce. 20:41 Milda got up but didn't feed. 20:52 Milda rolled the eggs. -all the "rollings" have been very mild after yesterday, almost nothing compared to what they did till yesterday afternoon. then they practically stopped. 21:16 Milda rolled the eggs. 21:47 Milda rolled the eggs. ame, Sonchik, As far as I understand it, the PC of mega2 is broken! Liz, that is really bad news! poor mega2, i hope that she will get a new pc as soon as possible. it seems that last night was much more peacefu that the night before that. i think Milda got to sleep last night. (0:37 - 4:17 my recording is missing so i don't know about that). 23:21 Milda rolled the eggs. 4:31 Milda rolled the eggs. 4:59 the baby talked to Mom. then Mom rolled the eggs. 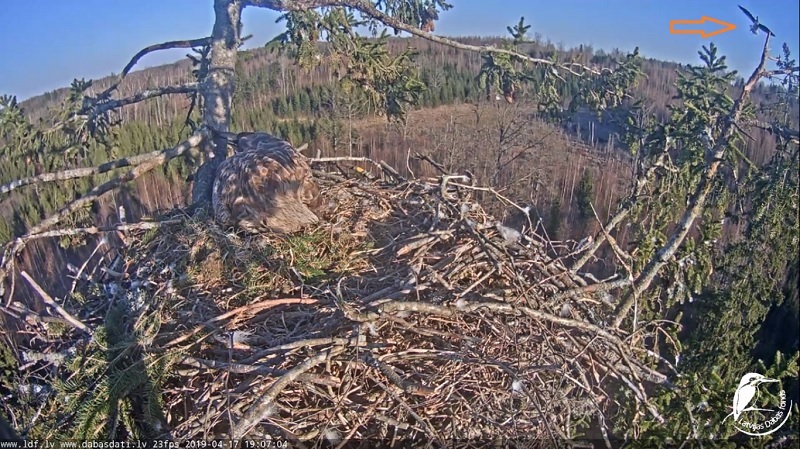 Milda is sitting calmly on her family.